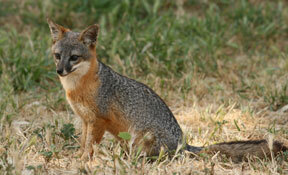 Friends of the Island Fox: Channel Island Foxes Reaching Recovery! Channel Island Foxes Reaching Recovery! 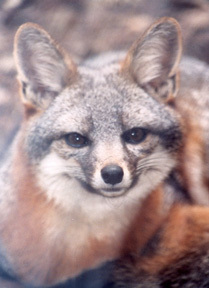 Twelve years ago, four subspecies of Channel Island foxes almost went extinct. Today in 2012, all populations are stable or increasing. The three populations of island foxes on San Miguel, Santa Cruz and Santa Catalina Islands have reached or are approaching the historic numbers documented before introduced disease and predation by golden eagles caused catastrophic declines. Yesterday, June 12, 2012, the biologists, field researchers, scientists, veterinarians, government agencies and conservation organizations that make up the Integrated Island Fox Recovery Team met to report on each island fox population, compare findings and discuss actions to be taken in the coming year. In twelve years, the San Miguel Island fox has gone from a low of 15 individuals to a thriving 581. This is an amazing population increase of 3,830%, as reported in “On Time, On Target; How the Endangered Species Act Is Saving America’s Wildlife” compiled by the Center for Biological Diversity. At the heart of this successful recovery is the Integrated Island Fox Recovery Team and the joint effort of people from Channel Islands National Park, Catalina Island Conservancy, The Nature Conservancy, Institute for Wildlife Studies, the U.S. Navy, CA Dept. of Fish & Game and the U.S. Fish & Wildlife Service, all working together, sharing information and experience. When you add concerned private citizens like you who help support continued monitoring of island foxes by funding radio collars and annual vaccinations, you have one of the most successful efforts to save an endangered species in history. Check back in the next few weeks for details from annual meeting.